It is never ideal for the woman to be the breadwinner and the man to be the home-keeper for the simple reason that the role reversal (a role dictated by our created natures) places each in a position contrary to their nature. A single woman may fit into the workplace as well as a man. A single man with children may function as the housekeeper, cook, homeschool teacher, etc., and do a fair job of it—all consistent with human nature. But the marriage relationship is unique. The man by nature is the savior, provider, and protector who braves the cruel world and carries the responsibility to protect and nourish his wife and family. It is in a man’s genes to take the command-and-control position. To become a dependent rather than the provider wreaks havoc on a man’s self-esteem. In our modern world, the one whose name is on the paycheck is the head of all finances, the one to be thanked and appreciated. That person is the fountain of the family, possessing the right of veto over all spending, and controlling the direction of the family where it involves finances. A bread-winning woman is not vulnerable and finds it difficult to come home and be a submissive, servant wife. To be forced to do so breeds resentment and a feeling of being used. I need not go on; you know these things and more to be true to nature and experience. But sometimes life throws unnatural curves and turns our world upside-down. We have to make do like a one-legged man. We get around and get along in the best way we can. When a man is disabled and cannot enter the labor force, the wife may be thrown into an unnatural role of breadwinner. Sometimes the children are forced to work to provide for the family. It is not natural but it is necessary. A dependent man will have to accept a different worldview and a different role. He will have to accept not being fulfilled in the normal manner. And the bread-winning wife will need to learn humility and to try to maintain a feminine demeanor at home, giving deference to the man, allowing him to be a handicapped king in his limited domain. The dependent man will also need to learn humility and to accept his dependency with thanksgiving and grace. Like any unnatural handicap, it will not be easy, but it is entirely manageable, and each can find fulfillment in their role reversals. However, when a couple reverses roles because the wife is able to make more money, or when the man is lazy and incompetent, or when she just likes to work and he just likes to hang out at home, you can be certain that neither is going to find fulfillment in their relationship, and their marriage is likely to end in the woman divorcing the man. When both the man and woman are reconciled to the reality that the man is handicapped out of the work force through no choice of his own, and not having to do with incompetence, it takes the edge off of blame and the discomfort of role reversal; but when they both know it is a choice, expect the man to shrink in his self-respect and the woman to grow masculine in her demeanor—leaving the marriage to suffer. That they may teach the young women to be sober, to love their husbands, to love their children, To be discreet, chaste, keepers at home, good, obedient to their own husbands, that the word of God be not blasphemed. *I realize these statements will be highly offensive to many women but we must remember to only allow sin and Satan to offend us. These statements are neither. God has made the husband the head over his wife and the wife was created to be his help meet. His responsibility is to provide for the family and her responsibility is to be a keeper at home which includes keeping it clean and tidy, doing the laundry, fixing meals, etc. This is what God has called her to do; to “look well to the ways of her household. A godly wife is a submissive, servant wife and doesn’t get offended by her husband’s requests or rebukes. 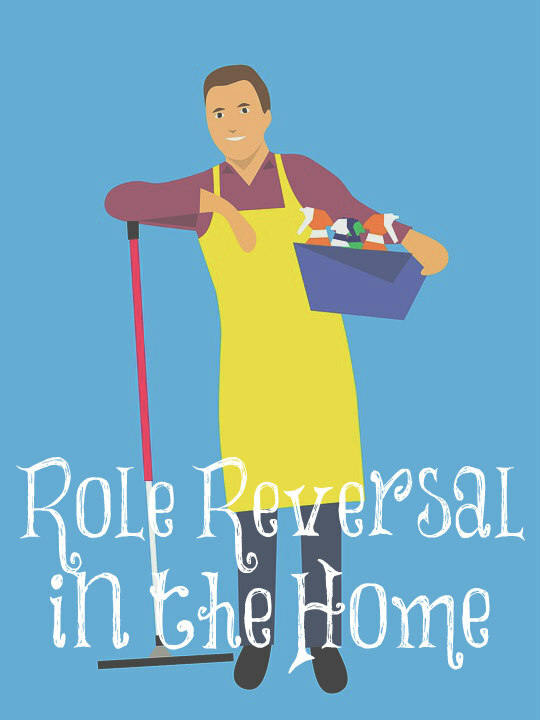 It’s one thing for a guy to do some things like washing dishes and stuff now and then, or the woman to take out the trash, but to do a complete role reversal is absurd! Especially with children! Mothers are vital for young kids, and need to be home with them, not shove them off so she can get “me time”! I would think any woman would be privileged to have a husband who can financially support her at home, as many families don’t have that option… It’s sad this world isn’t set up for the breadwinner, instead forcing women away from their kids! My mother wanted to stay home full time, but was forced to work to keep our insurance and other benefits. Luckily, she did have the option to go only part time to be with me as a child. Masculinizing women does not empower them, only misogynistic hold them up to men as the standard for a worthy human being! It’s a sad fact of our culture to wage this war between the sexes and have so blurred the lines between their roles that anyone who teaches them gets ridiculed and slandered but this is okay! God’s ways are perfect so we must still teach them, especially for the children’s sake. They need and want their mothers at home. I love how plainly he is able to speak God’s wisdom. Something else that made a difference in our marriage was when my husband took over the finances. Even though he worked and I stayed home, I was the one that paid the bills and somehow this really controlled my attitude. I love this, too, Shelley. Michael Pearl is my favorite Bible teacher! Some husbands delegate the finances to the wife which is fine, too. When my husband started doing the Bill’s instead of me, we started saving so much more money! Not that I bought useless things before because I did buy necessities, it’s just that i knew what we needed and bought it right away. And now I will ask before I buy things, usually it is a yes or we may have to wait until the next week. Not seeing how much money we have to spend helps me to not spend too much. The only negative is now I can never hide his birthday presents from him lol. A wise and thoughtful article. To be honest, I almost didn’t read it as I was afraid that I would be slammed. (Smile!) I am the breadwinner in our family. It is not by my choice per se, but my husband is not a Christian and was injured in an accident. He is able to work some but not like he did and the money is far, far less than we were use to living on. I am able to work from home 100% and make great money (6 figures) with my background (and our children are grown.) But the article is correct! When I am managing a project and telling people what to do and make deadlines, etc. most of the day, it is hard to step back into another role at home. Also, I try to tell the young women at church that I talk to when there is an opportunity, that I am exception not the rule. They should not use me as an example in working and career. This is so true. I have known many wife-works/husband-at-home situations, and in almost every single case, the husband over time adopts a more effeminate stance and manner, while the wife becomes more dominant. It’s subtle, but it’s real. I live in New Zealand. Right now, our Prime Minister – a 38 year old woman with a young baby – is on the world stage, in America, meeting with world leaders, while her partner looks after the baby (both of whom are with her in America as she is breastfeeding). I can’t think of anything worse, personally. This woman only had 6 weeks off work with her precious baby. I couldn’t do it! But she is, and she’s doing it well, and most of the country is proud of her. Amen! I love this. Your blog is so encouraging! I miss seeing your notepad wisdom on facebook (I got off of facebook, needed a break) But you truly are a biblical women and it is so hard to find role models to look up to in this chaotic world. You are a mentor for me! I’m only 25 and just got married in Janruary. My husband is my spiritual leader and I am his help meet, we take our biblical roles very seriously. I’m a stay at home wife (Thank the Lord!) While my husband provides for us. We are praying for kids soon! Gods timing. Keep us in your prayers to stay strong in our marriage and that the Lord will bless us with children soon. Most people don’t figure out the costs of having the wife work, day care, extra car, special clothing, fast food. It just does not work out well.